A leaked roadmap reveals some information that owners of certain Lenovo branded smartphones are dying to discover. 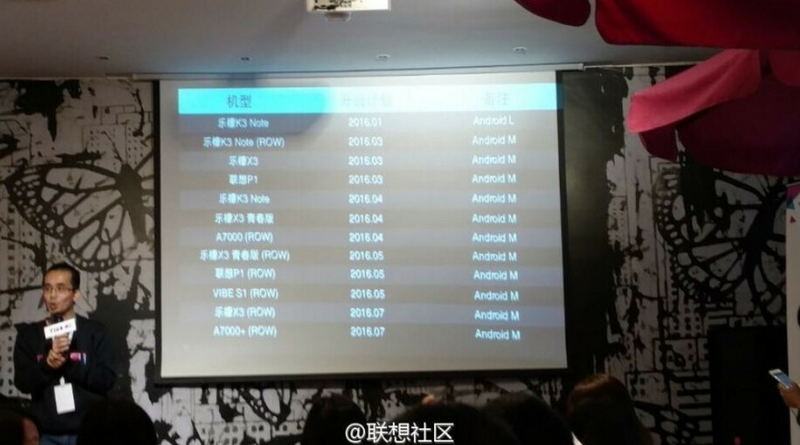 The roadmap allegedly shows when these handsets will be updated to Android 6.0. The first device on the list is the international version of the Lenovo K3 Note. The device is scheduled to receive the update in March, along with the Chinese versions of the Lenovo Vibe X3 and the domestic Lenovo Vibe P1. In April, Android 6.0 comes to the Chinese version of the Lenovo K3 Note, and the international version of the Lenovo A7000. In May, the international versions of the Vibe X3 and Vibe P1 will be updated to Android 6.0. In June, the international Lenovo Vibe S1 will receive the Marshmallow update, followed the next month by the international models of the Vibe X3 and A7000+. The leak was discovered on a Weibo post, which doesn't automatically preclude it from being legit. Still, it just might be a good idea to take this story with the proverbial grain of salt. Best processors = Samsung/Apple Best Screens = Samsung Best Camera = Samsung etc China can have the lowest prices award. Camera part is a joke. Best screens and Samsung ? Seriosly ? Did I wake up in 2025 ? I think i better stick with Moto phone in the future. Lenovo phone upgrade strategy still quite lacking. Where is the Marshmallow for Lenovo K920? I bought that phone for the best screen to phone ratio, 6" QHD screen@78.3% Unbeatable. Hey have you seen lenovo vibe p1 and p1m. I am using p1m. They are really making good phones Try p1, its full metallic, great build and 5000mah with fast charging, There ui is also not laggy like xiaomi phones, I am impressed with their new series phones, I guess they are making good phones compared to samsung. As I was saying, people here like criticizing phones that they haven't even touched yet. So don't mind him.